... and ending up looking like a painfully shy person. I went along to get a couple of books signed. Now, in my past I have stood up in front of hundreds of students to lecture without batting an eye. But, put me on the spot and ask me anything about me... well, let's just say I can turn to jelly. 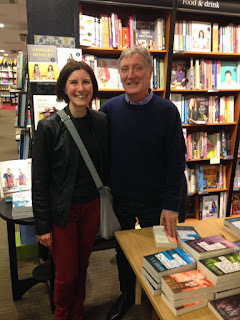 I was in the middle of talking to Frank Muir when one of the staff from Waterstones came over to take a picture of the two of us (the one above in fact). My shyness at meeting Frank Muir then turned to utter embarrassment and mortification as I felt like I looked as if I was trying to upstage his signing event. I explained (slowly turning beetroot coloured and beginning to sweat) that I was launching my first book there in a month and that that was why the staff had taken a picture of us. The conversation immediately turned to my book and what it was about and where it was set, while all the time I morphed into an inarticulate, red-faced person. And all the while, a large queue of people who had come to see him was forming behind me. He could not have been nicer to me or more gracious! He seemed genuinely interested and incredibly supportive. What on earth he must have thought of me, I don't know, as by the end I was a not altogether attractive shade of scarlet, slightly shiny with stress-induced sweat and quite probably sounding incoherent. But, I was delighted to have met him and am enormously grateful for the kindness and support he showed me both then and afterwards. If you're reading this Frank... Thank you!